This article is about the American Baseball Hall of Fame second baseman and manager. For his son, see Eddie Collins, Jr. For other people with this name, see Eddie Collins (disambiguation). Edward Trowbridge Collins, Sr. (May 2, 1887 – March 25, 1951), nicknamed "Cocky", was an American Major League Baseball second baseman, manager and executive. He played from 1906 to 1930 for the Philadelphia Athletics and Chicago White Sox. 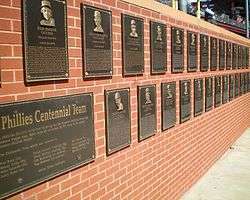 A graduate of Columbia University, Collins holds major league career records in several categories and is among the top few players in several other categories. Collins coached and managed in the major leagues after retiring as a player. He also served as general manager of the Boston Red Sox. He was inducted into the Baseball Hall of Fame in 1939. He died several years later after having suffered from heart problems for a number of years. As a native of Millerton, a 384-acre village in Dutchess County, New York, Collins was unique in his time in that he was focused on both his athletic skills and his education and intelligence. He graduated from Columbia University (where he was a member of Beta Theta Pi fraternity), at a time when few major league players had attended college. He started his American professional baseball career on September 17, 1906 when he signed with the Philadelphia Athletics at the age of 19. When he signed with the Philadelphia organization, Collins was still a student at Columbia. He played some of his initial minor league games under the last name of Sullivan so that he could protect his collegiate status. After spending all but 14 games of the 1907 season in the minor leagues, he played in 102 games in 1908 and by 1909 was a full-time player. That season, he registered a .347 batting average and 67 steals. He would also be named the A's starting second baseman in 1909, a position he would play for the rest of his career, after seeing time at second, third, short, and the outfield the previous two seasons. In 1910, Collins stole a career-high 81 bases and played on the first of his six World Series championship teams. As a player, Collins was renowned for his intelligence and confidence on and off the field, and on the field his exceptional batting skills as a top-ten hitter and his speed was known for having the only six-steal game in history, and he achieved that feat twice in two weeks, September 11 and September 22, 1912. He was part of the Athletics' so-called "$100,000 infield" (and the highest-paid of the quartet) which propelled the team to four American League (AL) pennants and three World Series titles between 1910 and 1914. He earned the league's Chalmers Award (early Most Valuable Player recognition) in 1914. In 1914, the newly formed Federal League disrupted major league contract stability by luring away established stars from the AL and NL with inflated salaries. To retain Collins, Athletics manager Connie Mack offered his second baseman the longest guaranteed contract (five years) that had ever been offered to a player. Collins declined, and after the 1914 season Mack sold Collins to the White Sox for $50,000, the highest price ever paid for a player up to that point. The Sox paid Collins $15,000 for 1915, making him the third highest paid player in the league, behind Ty Cobb and Tris Speaker. In Chicago, Collins continued to post top-ten batting and stolen base numbers, and he helped the Sox capture pennants in 1917 and 1919. He was part of the notorious "Black Sox" team that threw the 1919 World Series to the Cincinnati Reds. However Collins was not accused of being part of the conspiracy and was considered to have played honestly (his low .226 batting average notwithstanding). In August 1924, he was named player-manager of the White Sox and held the position through the 1926 season, posting a record of 174-160 (.521). Collins returned to Philadelphia to rejoin the Athletics in 1927 as a player-coach. He recorded only 143 plate appearances in his last four years, mostly as a pinch hitter. He did not play in any World Series games for the 1929 or 1930 World Series champion A's and his last appearance as a player was on August 2, 1930. Collins finished his career with 1,300 runs batted in. To date, Collins is the only MLB player to play for two teams for at least 12 seasons each. Upon his retirement, he ranked second in major league history in career games (2,826), walks (1,499) and stolen bases (744), third in runs scored (1,821), fourth in hits (3,315) and at bats (9,949), sixth in on-base percentage (.424), and eighth in total bases (4,268); he was also fourth in AL history in triples (187). He still holds the major league record of 512 career sacrifice bunts, over 100 more than any other player. He was the first major leaguer in modern history to steal 80 bases in a season, and still shares the major league record of six steals in a game, which he accomplished twice in September 1912. He regularly batted over .320, retiring with a career average of .333. He also holds major league records for career games (2,650), assists (7,630) and total chances (14,591) at second base, and ranks second in putouts (6,526). Collins is one of only 29 players in baseball history to have appeared in major league games in four decades. Following the A's 1930 World Series victory, Collins officially retired as a player and immediately stepped into a full-time position as coach for the A's. After two seasons as a coach, Collins was hired as the general manager of the Boston Red Sox. The new owner, Tom Yawkey, was a close friend and had actually bought the Red Sox at Collins' suggestion. He remained GM until the 1947 season, retiring at age 60 after a period of declining health. During his 15 years as general manager, Collins helped turn a dreadful team into a contender once again. On the debit side, he instituted an unofficial policy of not signing black players (an unofficial league-wide policy that stayed in place until Jackie Robinson's signing by Brooklyn Dodgers GM Branch Rickey and Robinson's debut with the AAA Montreal Royals in 1946). Author Howard Bryant writes that Collins' prejudice also extended to Jews and Catholics. Collins was inducted into the Baseball Hall of Fame in 1939. He struggled with heart problems for several years at the end of his life. He was admitted to a hospital in Boston on March 10, 1951 and he died there of the heart condition on March 25. In 1999, he was ranked number 24 on The Sporting News' list of the 100 Greatest Baseball Players, and was a nominee for the Major League Baseball All-Century Team. He played on a total of six World Series-winning teams (1910, 1911, 1913, 1917, 1929, and 1930), though he did not participate in any of the final two series' games. Under the win shares statistical rating system created by baseball historian and analyst Bill James, Collins was the greatest second baseman of all time. His son, Eddie Jr., was an outfielder who played for Yale University. He briefly saw major league action (in 1939 and 1941–42, all with the A's) and later worked in the Philadelphia Phillies' front office. 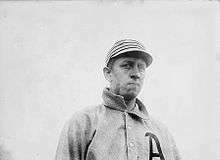 ↑ "Eddie Collins' rise in great baseball career". Reading Eagle. February 26, 1933. Retrieved December 13, 2014. ↑ "Different Story Now". The Boston Globe. September 29, 1947. Retrieved December 15, 2014. 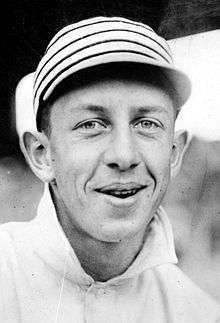 ↑ "Eddie Collins, baseball immortal, succumbs from heart condition". Ellensburg Daily Record. March 26, 1951. Retrieved December 13, 2014. ↑ Black, Lou (May 18, 1937). "Eddie Collins on day off, watches son play baseball". The Day. Retrieved December 13, 2014. Wikimedia Commons has media related to Eddie Collins.